Artists of 'Total Dhamal' also helped 50 lakhs for the families of soldiers killed in Pulwama. Bollywood actors Anil Kapoor and Madhuri Dixit are in the discussion about their upcoming film 'Total Dhamal'. In this film, he will be seen with Ritesh Deshmukh, Arshad Warsi, Javed Jafri and Ajay Devgn in the Star Lead Roles. All these stars have been in the promotion of the movie. Recently, Madhuri, Anil Kapoor, Ajay Devgan and Riteish Deshmukh reached Kapil Sharma's show. During the show, Anil Kapoor and Madhuri Dixit shared many things of their time with the people present there. Tell them their pair is a favorite pair of the 90s. Both have acted together in many hits like 'Beta', 'Sports', 'Rajkumar', 'Ram Lakhan'. 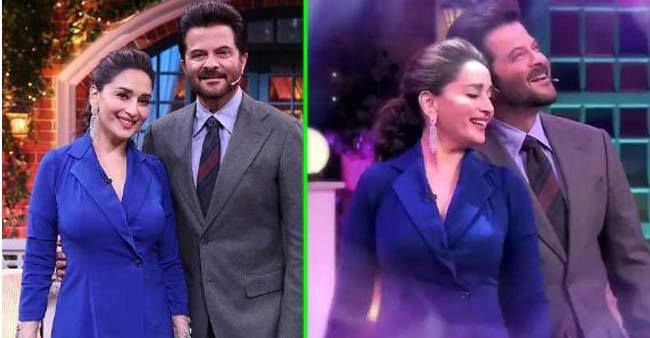 On Kapil's show, Anil Kapoor told that after all what Madhuri is angry with. The actor told that when Madhuri does not get his food on time, his mercury goes up. They told that Madhuri is very flourished. He could not stop himself by looking at the food. During the show Kapil and the audience, Anil and Madhuri danced on the romantic song "Dhankh Dhing" too. Talk about the movie, this film is the third film of the 'Dhhamal' series. The first movie 'Dhamal' was released in 2007 and 'double drama' was released in 2011. This movie has been every sequel hit. 'Total Dhamal' has been directed by Inder Kumar. The film will be released on February 22. This film is made from Ajay Devgan Films, Fox Star Studios and Coalition of Pen India Limited. After the recent terrorist attack in Pulwama, film makers and stars have decided not to release the film in Pakistan. This information was given by Ajay Devgan himself with his Twitter account. Besides this, they also helped 50 lakhs for the families of soldiers who were killed in Pulwama.